Four former champions and two previous finalists face a tough qualifying test to make this year's World Championship first round. Mark Williams, Ken Doherty, Graeme Dott and Peter Ebdon each have byes through to Tuesday's final qualifying round. So, too, does former finalist Matthew Stevens but Nigel Bond must win another two matches to progress. Steve Davis, who won six times in the 1980s, will not be among the last 32 after losing in the second round. Davis, 56, lost 10-8 to Craig Steadman at Ponds Forge in Sheffield on Thursday and lost his place on the professional tour in the process. The world number 71 now must return to qualifying school if he is to regain his tour card. Six-time runner-up Jimmy White also failed in his attempts to reach the Crucible, losing 10-4 to Ian Burns in the second round, but he has at least retained his place in the world's top 64. Burns now faces Robin Hill, with the winner facing 2002 champion Ebdon in the final round, while Doherty, the 1997 winner, will play either Steadman or Dechawat Poomjaeng. Bond, the 1995 finalist who has slipped out of the top 50 this season, beat Ross Muir 10-5 in the first round and now has first Stuart Carrington then, potentially, Ryan Day between him and a place at the Crucible. Welshman Williams - who won in 2000 and 2003 - and Dott - Scotland's 2006 champion - must both wait until Tuesday for the matches that will decide whether they will qualify for the main draw. Williams will play either Peter Lines or Alan McManus, while Dott will face the winner of the match between Alfie Burden and Kyren Wilson. 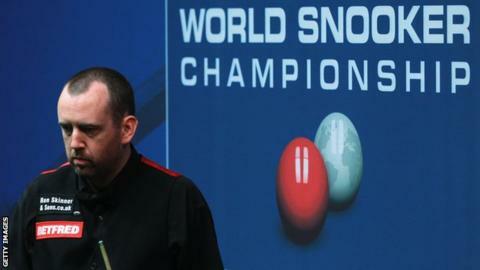 The World Championship first round gets under way on 19 April and will be live across the BBC.